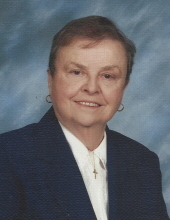 Eileen Clementine Didyk, a longtime resident of Dearborn, died peacefully in Brighton on February 6, 2019. She was 88 years old. She was preceded in death by her beloved husband, Eugene and her friend, Dave Deford. She is survived by her sons, Eugene D. (Kathleen) and Stephen (Terri); grandchildren, Nick and Chris Didyk, Stephanie Didyk; sister, Wilma (the late James) Guyot, as well as cousins, in-laws and extended family members. Visitation will be held at Lynch & Sons Funeral Home, 600 E. Main St., Brighton on Sunday, February 10, 2019 from 2-7 PM, Scripture Service at 6 PM. A Funeral Mass will be held at St. Mary Magdalen Church, 2201 South Old U.S. Hwy 23, Brighton, Michigan 48114 on Monday, February 11, 2019 at 11 AM with visitation beginning at 10 AM. Luncheon to follow. Burial will take place at Cadillac Memorial Gardens West, Westland, Michigan. Memorial contributions may be made in her name to St. Mary Magdalen Church, American Heart Association or Visiting Angels in Brighton. "Email Address" would like to share the life celebration of Eileen Didyk. Click on the "link" to go to share a favorite memory or leave a condolence message for the family.